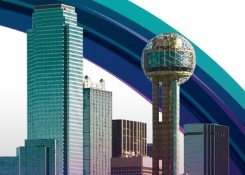 Ambit Energy’s annual AMBITION event, underway in Dallas, Texas from September 11-14, delivers more of everything for Consultants and prospects. It’s four days of training, networking, fun and, above all, inspiration. This year’s event is themed “Reach Further” and features speakers, educational sessions, discussions and other ways to help Ambit Consultants grow their business. And it’s not just business—there are parties, comedy, music, games, fireworks and plenty of opportunities to mingle with other excited attendees. In fact, AMBITION 2013 is bigger and better than ever, with more contests, more attendees and an amazing collection of speakers. Attendees are enjoying many of their favorite events, like the Corporate vs. Consultant Grudge Match Softball Game, a golf tournament and the opportunity to honor some of our highest achieving Consultants for 2013. AMBITION is happening at an impressive list of venues including the Kay Bailey Hutchison Convention Center and the American Airlines Center. And, of course, we’re thrilled to be partnered with exceptional host hotels like the Hilton Anatole Hotel, Sheraton Dallas Hotel and Omni Dallas Hotel. Year after year, our Consultants report that AMBITION is one of the most important contributors to growing their businesses. Not only that, our statistics show that Consultants who attend AMBITION obtain higher levels of success than those who don’t. Whether you’re just starting out or have been with Ambit for years, attending as many AMBITIONs as you can is a smart move. For more information about AMBITION, please visit the Ambit Energy EventCenter or follow #AMBITION13 on Facebook, Twitter, Google+ and Instagram.